A THX Ultra 2-certified 5.2-channel array that costs less than two-grand? What's the catch? From the country that brought us mythical beasts like the Minotaur comes a speaker system that’s something of a titan itself. Athens-based Crystal Acoustics has unleashed the T2-5.2-UL, a THX Ultra2-certified speaker system with floorstanding fronts, dipole rears and not one but two subwoofers. And all for under £2,000. It’s not a system for the faint-hearted though. You get a lot of boxes for your money, and big ones at that. But if you have a viewing room waiting to be filled with thunderous multichannel sound, then the T2-5.2-UL could be worth the backache. Believe it or not, this is actually a scaled-down version of the bonkers T2-7.4-UL, a £3,000 7.4-channel system aimed at serious bass junkies. The THX Ultra2 certification means this setup is ideal for rooms up to 3,000 cubic feet in size, with a viewing distance of 12 feet or more from the screen. The subs are absolutely massive – many people would struggle to get just one of these in their living room, let alone two. With the rest of the speakers also sporting big, bulky cabinets, it’s worth stating that this is not a system you quietly integrate into your existing layout – you stick it in the room first and arrange everything else accordingly. In fact, I’d go as far to say that it’s an array for dedicated cinema spaces only. The front floorstanders (TX-T2SE) stand just over a metre high. With their grilles on, they’re somewhat bland to look at. Whip the grilles off and you’ll uncover yellowish cones with silver phase plugs poking out in the middle, giving them a slightly quirky feel. That quirkiness continues with the balls on top of each cabinet, an updated version of Crystal Acoustics’ ‘free air’ tweeters. Placing them on top allows them to shoot high frequencies at your lugholes without unwanted diffraction, and each one can be rotated towards your listening position. The’ driver array is completed by two 6.5in Kevlar/fibre woofers, each housed in their own ported chamber. As advised by the THX spec, the rear speakers are a dipole design. These offer a listening experience like that of a real cinema, dispersing the sound into the room and along walls for maximum immersion. They can be mounted on the wall using the supplied brackets. Meanwhile, the THX-CT centre speaker is a bulky beast, again with a rotatable ‘free-air’ tweeter perched on top that may make placement a bit tricky. The TX-12SUB subwoofer comes equipped with a front-firing 12in long-throw woofer moved by heavy duty magnets, backed up by a 200W amplifier. The high gloss and black ash cabinet matches the rest of the system, with dual ports and extensive bracing to make them as acoustically dead as possible. With just one sub ostensibly capable of shaking your home’s foundations, why would you need two? There are several advantages, the main one being that bass is distributed more evenly throughout the room so that low-end frequencies sound good from any listening position. It can also help to cancel out boomy resonances and control standing waves in certain areas of your room. And of course, two subs give a more potent performance, enabling the system to hit THX’s reference output. It takes a bit of trial and error to get it right, though. Helpfully, each one provides a range of controls on the back to tweak the volume, reverse the phase and select between ‘variable’ and ‘THX’ modes – the former allows you to control the volume using the dial, while the latter meets the THX spec with amplifier gain set 4.5dB lower. 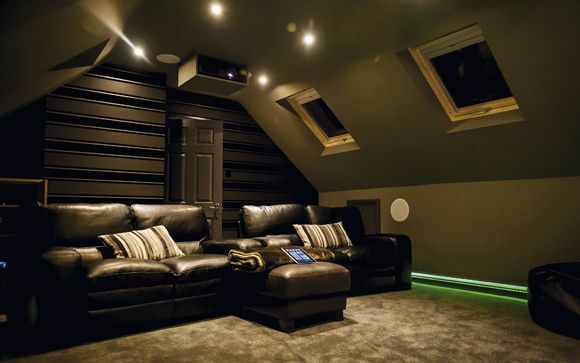 After placing the subs on opposing walls, which achieved more satisfying results than opposite corners of the room, I stepped into the intimidating 5.2 arena armed with a DTS-HD Master Audio test disc filled with juicy scenes from various blockbusters – and the T2-5.2-UL gobbled it up and snarled for more. This is a powerful performer, capable of large-scale dynamics with effortless control and drive. That’s due largely to the twin subwoofer arrangement – which sends robust, forceful bass into every nook and cranny – but it’s commendably hammered home by the front, centre and surrounds. Inter-speaker integration is watertight and the soundstage is spacious. Take X-Men: First Class for example. As the mutants gear up for an air attack on Russian warships, the pounding drums create a sense of stirring urgency, faithfully communicated by the front trio. Jet engines scream around the room, passing between front and rear speakers with tonal consistency and smoothness. Then the coup de grâce, as the missile hisses its way towards the battleship and blows it up with a rich, visceral boom. A loud, punchy blast, but beautifully controlled. Designed with movie thrills in mind, the CA package favours firepower over finesse. If you’re looking for glacial objectivity and clinical detail retrieval you should hunt elsewhere. That’s not to say there’s no sophistication. High frequencies sound crisp and sparkly, plus the centre’s dialogue is imbued with depth and texture. But it doesn’t get right inside a scene and pull out those super-fine details like some similarly-priced systems can. But that’s a minor drop of negativity in an ocean of positives. The T2-5.2-UL is great value, boasting good build quality and providing adrenalin junkies with a fix of unadulterated power. And even if it’s not your cup of tea, Crystal Acoustics’ no-quibble 60-day returns policy (this is a mail-order retailer, remember) means you can send it back – but with this sort of performance, that really would be a Greek tragedy.